1B Umpire Jerry Meals ejected White Sox Manager Rick Renteria (Replay Review decision that upheld 2B Umpire Ed Hickox's out call; QOCN) in the top of the 5th inning of the White Sox-Rays game. With one out and one on (R1), White Sox batter Omar Narvaez hit a ground ball to Rays second baseman Joey Wendle, who threw to shortstop Willy Adames to first baseman Jake Bauers for a double play. Upon Replay Review as the result of a Manager's Challenge by Renteria, Hickox's ruling that Adames tagged second base prior to baserunner R1 Yolmer Sanchez's arrival stood. 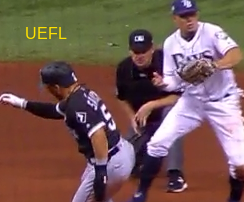 Replays indicate Adames did not appear to field Wendle's throw and tag second base prior to Sanchez's first touch of the base, the call was incorrect. Ruling was reviewed and affirmed by the UEFL Appeals Board (7-0-2), the call was incorrect. At the time of the ejection, the game was tied, 1-1. The White Sox ultimately won the contest, 2-1. This is Jerry Meals (41)'s third ejection of 2018. Jerry Meals now has 2 points in the UEFL Standings (2 Prev + 2 MLB - 2 Incorrect-Crewmate = 2). Crew Chief Jerry Meals now has 4 points in Crew Division (4 Previous + 0 Incorrect Call = 4). This is the 109th ejection report of the 2018 MLB regular season. This is the 46th Manager ejection of 2018. This is Chicago-AL's 7th ejection of 2018, 1st in the AL Central (CWS 7; KC 4; DET, MIN 3; CLE 1). This is Rick Renteria's 5th ejection of 2018, 1st since July 27 (Fieldin Culbreth; QOC = N [Check Swing]). This is Jerry Meals' 3rd ejection of 2018, 1st since July 14 (Aaron Boone; QOC = Y-C [Dead Ball K3]).